The pork shoulder may be the world’s simplest cut of meat to cook. Simpler than steak. Simpler than brisket. Simpler than ribs. In a nutshell, you season the hell out of it (for tips on buying and seasoning pork shoulder, see Parts 1 and 2 of this series) and cook it at a low to moderate heat for 3 to 6 hours (2-1/2 to 3 hours at 350 degrees; 5 to 6 hours at 250 degrees.) What emerges from your smoker or grill gives you a bodacious blend of crisp crust, luscious fat, and meltingly tender meat. But simple doesn’t mean simple-minded. You’ll need to know about some essential gear and techniques to get it right. Thanks to its generous marbling, pork shoulder lends itself to a variety of live fire cooking methods, including indirect grilling, smoking, and spit-roasting. The advantage of these methods is that you get both a crisp crust and moist, tender meat. Smoking, a.k.a. barbecuing: This is the preferred method of the American South, using a low heat and a long cooking time (in other words, “low and slow”), and always done with wood smoke. You can achieve this in several ways: firing your pit with logs, or tossing soaked hardwood chunks or chips on a charcoal fire. Keep the cooking temperature in the 225 to 275 degree range. Look for a dark “bark” (crusty exterior) and reddish smoke ring just under the surface. Indirect grilling: As the name suggests, the food is cooked next to, not directly over, the fire in a covered grill working at a moderate (325 to 350 degree) heat. This speeds up the cooking time and gives you a super crusty exterior and unlike smoking, you can do it on a gas grill. Yes, you can toss soaked wood chips on the coals (or in a gas grill’s smoker box) to produce a smoke flavor. 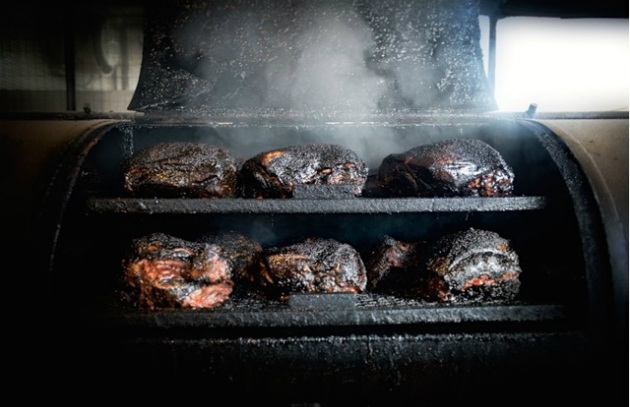 Spit-roasting: Few sights on Planet Barbecue are more inviting—or hunger-inducing—than a pork shoulder rotating slowly on a turnspit next to the fire. The meat browns, crisps, and best of all, bastes itself. But don’t take my word for it: spit-roasting is the preferred method for cooking pork shoulder in Puerto Rico, Tuscany, Bali, and just about everywhere in between. Spit-roasting is usually done at higher heat than indirect grilling or smoking—350 to 400 degrees. Time is shorter, too. Recommended for Spiessbraten, Balinese Roast Pork Shoulder, and other dishes that don’t traditionally require a smoke flavor. Pork shoulder is one cut I encourage you to overcook. In recent years, it’s been fashionable to serve pork medium or even medium-rare, which is fine for lean, tender cuts, like loin and tenderloin. Most of the world’s grill cultures serve pork shoulder well-done, that is, cooked to about 195 degrees F. Only at this internal temperature can the shoulder be “pulled” (torn) or chopped into the meaty shreds so prized for Carolina pulled pork. Instant read meat thermometer: A critical piece of equipment when gauging the doneness of a thick cut of pork as collagen and tough connective tissue don’t break down until they reach a critical internal temperature of 190 degrees or higher. Insulated food gloves: These thick gauge rubber and fabric lined gloves protect your hands when you manually pull the still-hot pork shoulder (cold pork won’t pull) into meaty shreds for pulled pork sandwiches. Meat claws and other pork pullers: While you can certainly use common table forks or your hands to shred pork, it’s even easier with a specialized tool called a pork puller. You might think serving is the easy part, but there are a few tricks of the trade you should know. Like all roast meats, pork shoulder benefits from a rest after it’s removed from the grill or smoker. The rest improves the texture and allows the juices to redistribute themselves. Transfer the meat to a cutting board, loosely drape with foil (do not tightly wrap), and let it sit undisturbed for 20 minutes. Or borrow a technique from competition barbecue cooks: Wrap the shoulder in butcher paper, then thick towels. Tuck it in an insulated cooler for up to an hour. Note: Skip this step if you prefer a crusty bark on your pork as it will soften in the steam. Pull or shred pork shoulder while it’s still uncomfortably hot to the touch, removing and discarding the bone, large lumps of fat, and any other bits that don’t look appetizing. (This is why the insulated food gloves referenced above are a help.) If you’re having trouble pulling the pork, switch to Plan B and either chop the meat with a heavy cleaver or slice it against the grain. Both are respected practices in Tennessee and Kentucky. When serving pork shoulder, figure on 8 ounces per person for straight meat or 4 to 6 ounces per person on sandwiches. 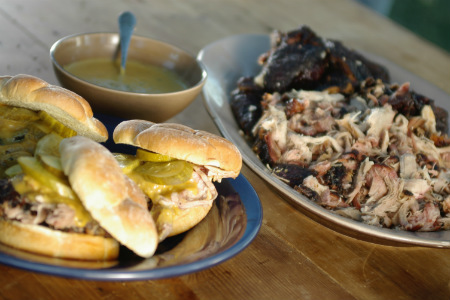 Because pork shoulder is so fatty, it’s often paired with vinegar or mustard sauce, pickles, cucumbers, and/or slaw.